Essentials never had it so good. Keep your lipstick, cash, cards and more, secure with these Small Scarlett Pouch. Each has three inside card slots and a secure zip top closure make this a great complement to your handbag and versatile enough to carry on its own. 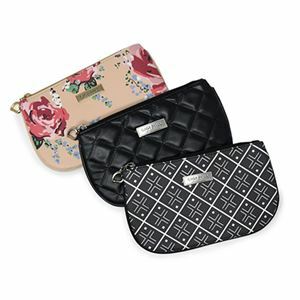 This bundle includes one Floral, Geo and Quilted Black Multi-Functional Pouches. Care Instructions: Our faux leather, coated cotton canvas, and bengaline materials are water resistant and stain resistant and are designed to stand up to your everyday challenges. For most common stains: Blot stains using a clean damp cloth and mild soap, non-bleach formula, or a stain treatment pen or wipe. Never immerse your BAG in water as it could cause it to pucker. Faux leather trim can also erode when immersed in water. Please be certain to thoroughly test an inconspicuous area prior to actual stain removal to avoid uncontrollable variations in material reaction.